A BMW sedan again caught fire on a road in South Korea on Monday, the latest in a spate of reported car fires related to the German brand that have heightened safety concerns and prompted a recent massive recall here. The fire broke out in the rear part of the gasoline-powered BMW M3 while it was being driven on a expressway in Namyangju, northeast of Seoul at around 5:53 p.m., according to police and firefighters. They said no one was hurt because the driver and the passenger immediately parked the car and escaped to safety. "I heard a bang in the rear of the car while I was driving it and then smoke began to rise," the car's owner, identified only as Byun, told the police. The incident was the 39th case of a car fire linked to the German brand to have been reported so far this year. Of the 38 cars that previously caught fire, nine were models not subject to voluntary recall. 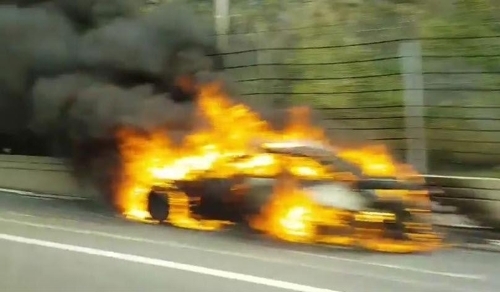 "Although we need further investigation, the car that caught fire this time is the M3 model that was excluded from a voluntary recall," a police officer familiar with the issue said. "We understand the car had no special problem until recently." Police and firefighting authorities are trying to determine the exact cause of the fire.